I kind of didn’t mean to, but I posted basically all Tex-Mex stuff this week. If you need some inspiration for this Cinco de Mayo Saturday, make some tacos, some salsa, or some nachos if you’re feeling ambitious. Or you could just make these delicious Southwestern Hash Browns. They are the perfect way to start your Tex-Mex day. 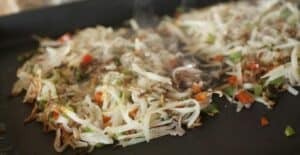 Shredded potatoes mixed with classic Tex-Mex ingredients and cooked on the griddle until nice and crispy. Happy Cinco de Mayo! 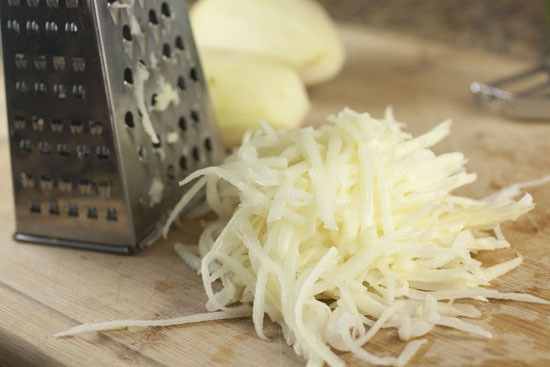 1) Peel potatoes and grate them. 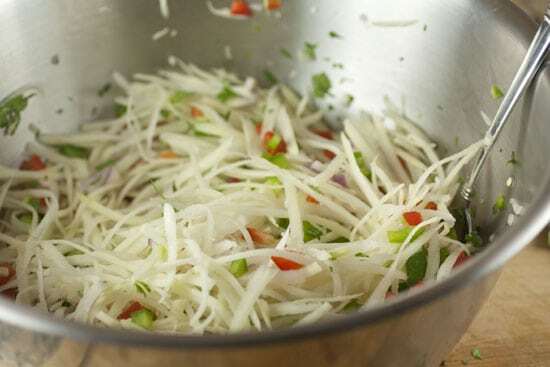 Rinse the shredded potatoes under cold water to rinse off extra starch. 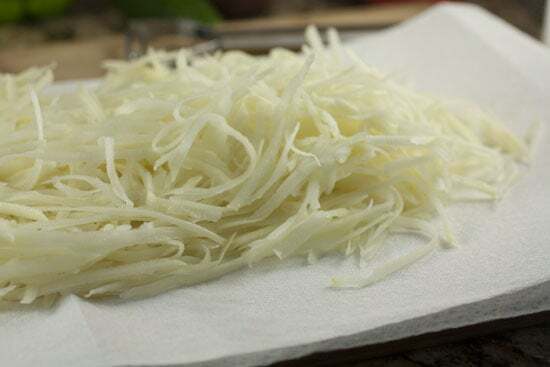 Then press the shredded potatoes between a few paper towels to dry them off. 2) Seed and dice jalapeno along with other veggies. Dice them pretty finely. 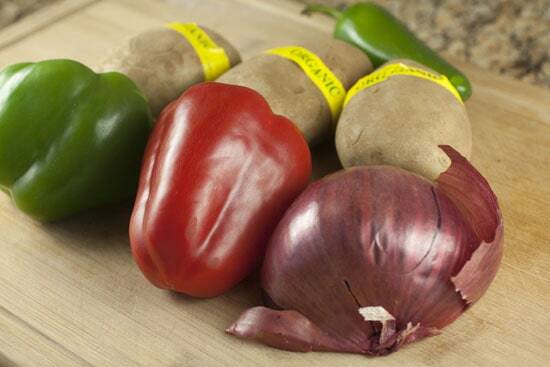 3) Mix veggies in a large bowl with shredded potatoes. Season with a pinch of salt and pepper. 4) Heat a large griddle over medium heat. Add a good drizzle of olive oil to the griddle and spread out the potato mixture. Let it cook, undisturbed, until the edges start to brown, about 5 minutes. 5) Start flipping the potatoes so they cook evenly. If they look dry, drizzle on some extra oil so they brown nicely. 6) As the potatoes continue to brown, use your spatula to form 3-4 large rectangles out of the potatoes. Keep cooking. 7) Flip the hash browns and try to keep the rectangles together so they form a solid chunk. Cook until crispy on the outside, another 5 minutes. 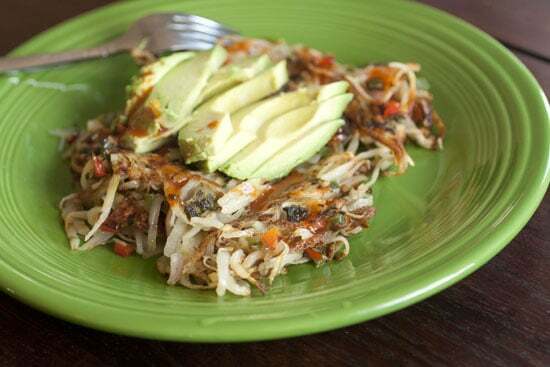 8) Serve hash browns immediately with sliced avocado, a pinch of salt, and hot sauce. Optionally, you could top with an over-easy or poached egg. Obviously the backbone of these Southwestern Hash Browns is potatoes and I like to shred mine fresh, but in a pinch you could use the frozen shredded potatoes as well. But don’t stop at potatoes. There is a wide world of veggies at your disposal for these hash browns. I shied away from adding tomatoes (or salsa) just because I thought it wouldn’t crisp up nicely. I did add a few different kinds of peppers, some red onion, and some cilantro though. While you can use a food processor to shred potatoes, I only use mine if I’m making a lot of hash browns. I don’t really think it’s worth it for just a few potatoes though. The clean up of the food processor takes longer than just busting out a good box grater and running a few potatoes through it. I like to peel my potatoes for hash browns, but if you want a more rustic look, just scrub them really well and leave the peel on. The key thing to do when you are cooking fresh potatoes that are shredded is to make sure you A) Rinse them and B) Dry them. I know. This is an annoying step, but it’s really important to wash off some of the extra starch on the potatoes. I scoop all my shredded potatoes into a colander and then rinse them well with cold water. Once they are rinsed off, lay the shreds out on a few paper towels to dry. They don’t need to be perfectly bone dry, but wet potatoes will steam rather than crisp on the griddle. So the drier you can get them, the crispier they will get later. Water does not equal crispy. 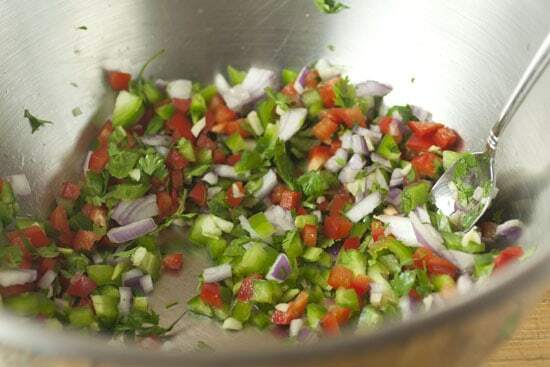 Dice all your veggies and add them to a large bowl. This part isn’t rocket science and again, feel free to experiment with other peppers and flavors here. Then add in your rinsed and dried potatoes and toss everything together. The potatoes should be well-speckled with lots of peppers and add-ins. You have some options when it comes to cooking these bad boys. You could definitely cook them in some sort of large skillet, but you won’t be able to do them all at once. That’s a bit annoying in my opinion. I think you could do them in the oven. 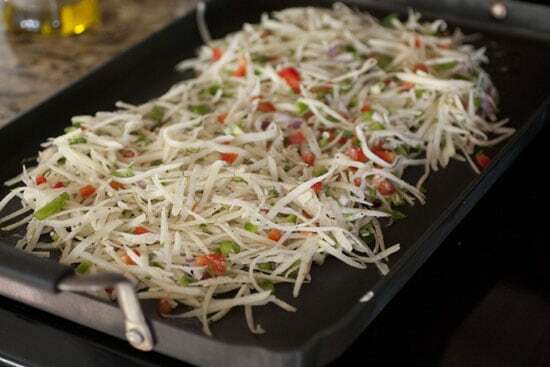 Lay them out on a baking sheet that’s been oiled well and drizzle oil over the hash browns. Bake them at 350-400 degrees for 10-15 minutes and check/flip them regularly. They should crisp up just fine. The best way to cook them though, in my opinion, is on a large griddle. This way you can control the heat really well and also cook them all at once. 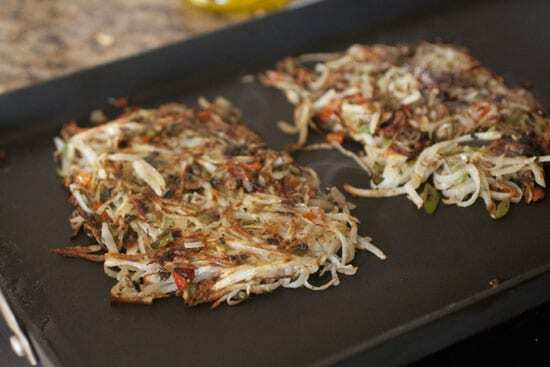 Just add a good drizzle of olive oil to your griddle and then lay out all of your hash browns. A griddle makes these easy. Hit the hash browns with a good pinch of salt and pepper and let them cook, undisturbed for about five minutes. When they start to get browned around the edges, they are ready to flip. Flip them and let them cook for another five minutes or so. Eventually, you can kind of partition the hash browns into large rectangles (servings). I like mine really crispy so I cook them for 15-20 minutes total on medium to medium-high heat. If they ever look dry, drizzle on some more olive oil. Remember, brown equals crispy so this is about how I like mine! You could serve these just as a side, but you can easily make a meal out of it as well. Top each rectangle with some sliced avocado, hot sauce, and maybe a poached egg or two and you are in for a treat. An egg isn’t a bad idea. This is a really simple recipe but it has some great flavors in it. It’s really hard to go wrong and would be perfect to have for brunch tomorrow. This is Dr. Macheesmo’s cure for all those cervezas you’ll probably drink today! As much as I make potatoes and as much as I make southwestern food, I can-NOT believe I’ve ever made potatoes this way. Love this recipe. Also love that action shot. :) And one more love: That green Fiestaware plate. Happy Cinco. I love the addition of hot and mild peppers for added color and flavor. I rarely ever make them to eat at home, but I could go for these. Before I’d heard that you need to RINSE and DRY the shreds a few months ago, every ‘hash brown’ I made turned to gluey mush. If your browns aren’t crisping, that’s definitely the step you need to focus on. That’s the bug I fixed. Being griddleless, I’m still forced to compromise on the ‘ONE FLIP’ Commandment, as in, ‘Thou Shalt Not Stir Fry Your Hash Browns’. Looks very good. I have a question though…where does the flour come into play? Thank you!